The bright Orion belt star, Alnitak (O class), lies to the left (you can just see that it has a companion – B class). The Burning Bush or Flame nebula is just below that (NGC 2024 or Sharpless-2 227). To the right is Barnard 33 – the Horsehead dark nebula – dense, cold dust and gas backlit by a cloud of glowing hydrogen gas (IC 434). Go left and downwards from B33 and there are two dust/gas cloud reflection nebulae lit by bright stars. The larger one is NGC 2023.The smaller is IC 435. 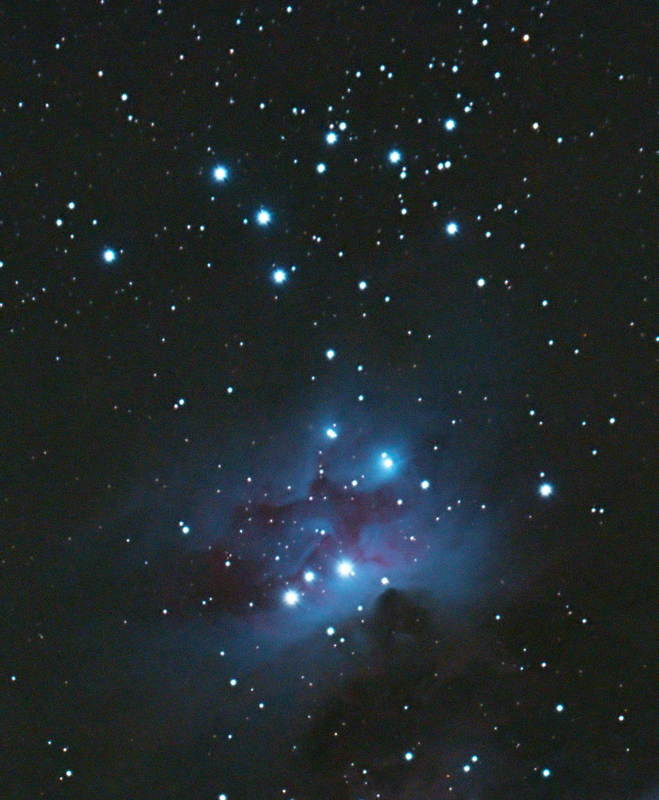 Canon 60Da at ISO 800 – 14 x 5 minute exposures. Guiding and dithering with SSAG/PHD. Drizzling and post processing in PixInsight. Orion widefield: click to enlarge NGC 1981 open cluster and NGC 1977 running man reflection nebula: click to enlarge NGC 1977 running man reflection nebula: click to enlarge. I have waited SO long for a clear night and at last it came! Orion is now low in the sky so this was my last chance to image these targets for this year. Set up as usual and wasn’t sure if I had a great polar alignment – also, the Orion nebula is so bright that long exposures burn out easily so I chose 2 minutes as a good compromise. I was keen to use “dithering” with my auto-guider as it is said to reduce noise and bring out subtle detail – seemed to work very well. Am also now using “Neat Image” anti-noise software which has made a big difference. 480/80mm refractor. 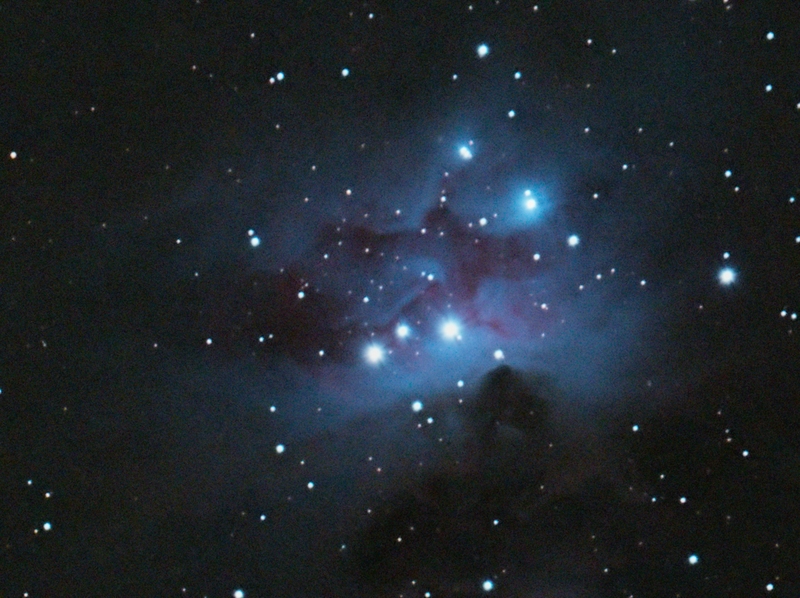 Canon 60Da at ISO 800, 14 x 2 min sub-exposures. Astro-Hutech LPS filter. Ioptron ZEQ25GT mount. SSAG/PHD auto-guiding/dithering (dithered: every sub at 2 pixels). Focusing and camera sequencing/control with BackYard EOS. 30 darks and 25 flats (white LED panel: 1/20s @ ISO 800). Post-processed in PixInsight 1.8 and Photoshop CC 2014. Noise reduction with Neat Image. 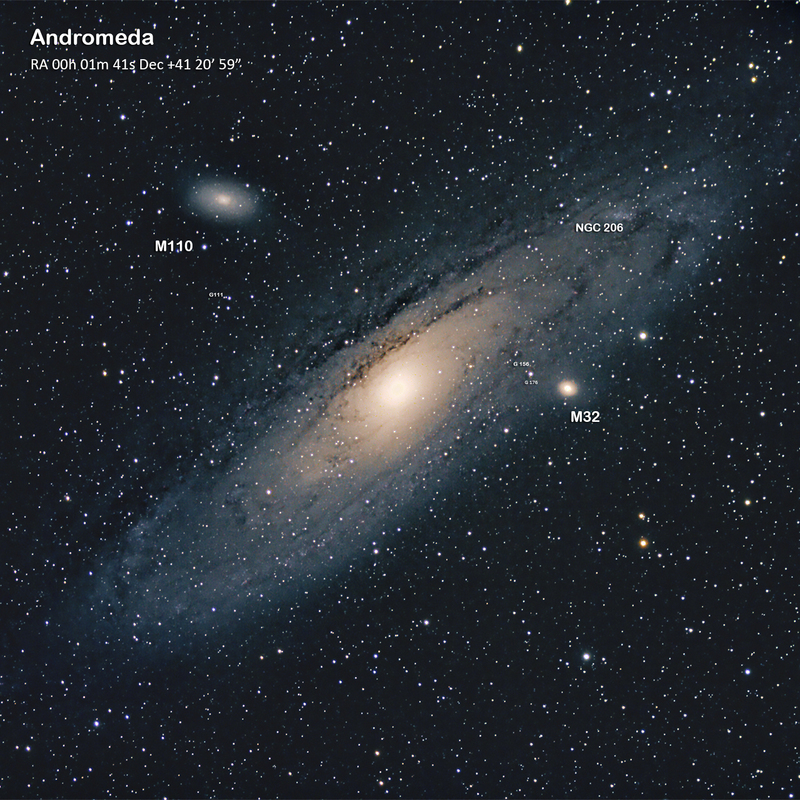 In the November 2013 edition of Sky and Telescope magazine, Alan Whitman mapped out structures within Andromeda that he has observed with his 16-inch Newtonian and a colleague had observed with a 12.5 inch Newtonian scope. Whitman A. Going Deep: Exploring Messier 31. Sky and Telescope 2013; Nov: 58-61. Newtonians are famous for being able to grab lots of light and resolve at high magnitude but long exposure astrophotography gives you a chance to catch up. The first page of the article is a black and white photographic negative of Andromeda that has been labelled with all the globular clusters (G designation), open clusters (C designation) and stellar associations (young, star-forming regions, A designation) that the pair have observed over many years. I have used their map to construct my own based on my 115 minute integration with just a 71mm scope and have labelled everything that I could match on their map with my own. These black and white negative “plates” are interesting because this is how Astronomers in the 1920s, such as Edwin Hubble explored the Cosmos. One of Hubble’s smartest moves was to hire the best photo technician and developer that he could get so that his plates were of the highest quality. G = globular cluster (located immediately to left of letter “G”). C = open cluster(s) (located immediately above or below letter “C” OR circled if close together). A = stellar association (circled). I am just amazed that I can locate globular clusters around a galaxy 2.5 million light years away with a 71mm scope in my back garden! Andromeda is one of the classic astronomical images but is notoriously difficult to get right because of the range of brightness from inner core to outer spiral arms. It’s also a large object and requires a wide field scope. I planned to use my WO Zenithstar for this as it’s focal length is probably about 380mm with focal reducer attached. I’d also read that light pollution filters suppress colours in galaxies so I used a HEUIB filter instead of my usual CLS filter. (Hydrogen alpha Enhancing UV and IR Blocking). This was the first time I had used a Astro Hutech (round) drop-in DSLR filter. Previously, I had used Astronomik (rectangle) filters and had noticed a 4 spoke diffraction artefact around bright stars with long exposures and wondered if it was due to a rectangular object in the light path. Guiding was good and I got the following exposures using Backyard EOS to control the camera. So that’s 114.5 minutes of data in total. A range of exposures was used to blend the bright core and faint spiral arms together. Dew was just starting to gather on the scope by the end – not usually so much of a problem for refractors but at this stage, the scope had been pointing near Zenith for over 2 hours. Unfortunately, I made a mess of my dark frames by setting the camera to JPG rather than RAW and I also found the lack of a light pollution filter produced a brown washed-out mess at the end of the night but I was able to use PixInsight’s colour neutralisation and colour saturation tools to rescue things eventually. On the plus side, the diffraction artefact was gone. I think for my light polluted site, I’ll just stick with CLS light pollution filters but go with the Astro Hutech round version. 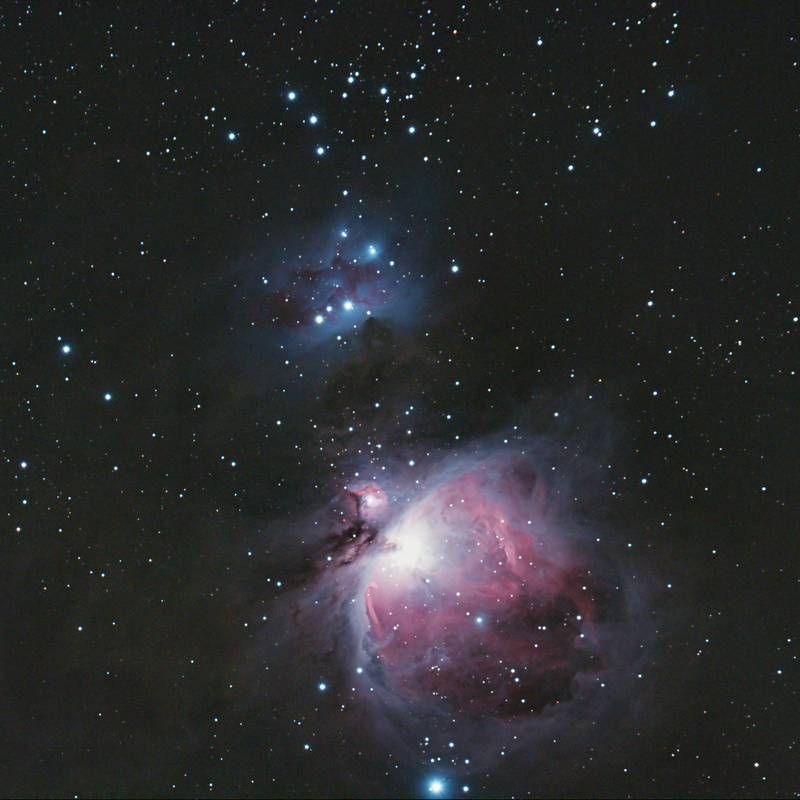 WO Zenithstar 420/71mm with 0.7 focal reducer, Modified Canon 60D at ISO 400 with Astro Hutech HEUIB filter. Ioptron ZEQ25GT mount with Orion SSAG/PHD guiding. I have marked in Andromeda’s 2 companion elliptical galaxies, M32 and M110 plus a bright star forming region in Andromeda, NGC 206. Andromeda has many more globular clusters than our Milky Way galaxy, and several of them can be located in this type of image by comparing against charts, I’ve marked 3 so far. They all have G designations, eg G111.